Another part of the routine of Look Up Lodge was the after-lunch games. 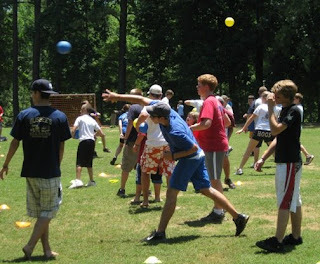 Upon arrival at camp, campers are divided into teams and assigned a "color." Our color was black. Everything we did at camp, we did with our color group and made most of it a competition. Of course, Black team was the best. 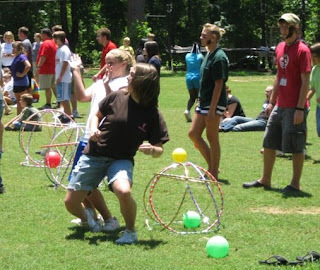 After lunch each day the teams would compete in crazy games. 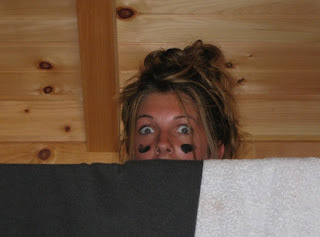 First, we'd have to put our war paint on - in our team color. Sara, above, and Doug, here, are showing you how fierce we looked in our black war paint. Well... Doug doesn't look much different than a normal workday. But you get my drift. Now, Mo, here is experiencing a transformation moment. You can see it in her eyes, she is being transformed into a machine. 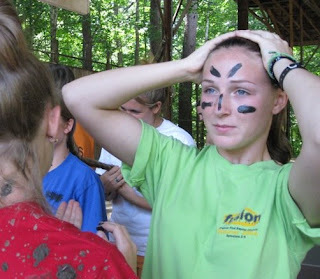 Marj was born for the war paint. Brielle doesn't seem too sure, but Marj's into it all right. 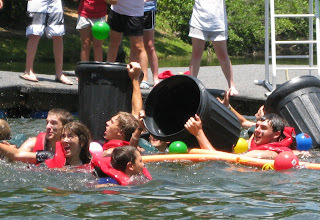 For the water game, each team took a trash can in the lake and put some team members in the water and some team members back up on the docks. The ones on the docks were to throw balls into the trash cans. The ones in the water were to catch stray balls and toss them back to the dock teammates to re-try. Each team could post one "guard" around an opposing team's trashcan. Here's a shot of our guys out there heaving the balls. 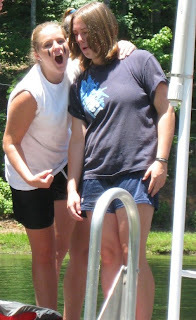 We were hot with this game, baby, HOTT. 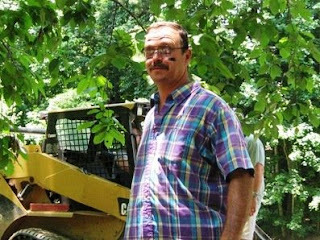 The best game, the one in which I threatened to leave camp if they involved me..... was the mud day. 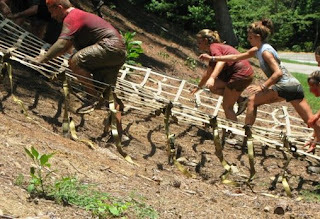 They had an obstacle course to complete, most of which was covered in mud, covered in mesh to crawl under, and had staffers scattered about to trip you up or throw mud on the kids. Marj was in the lead for our team, or maybe second, I don't remember, but you can see Grayson rapidly approaching and when she jumped in the mud hole, a kid jumped right on her back and slowed her down & Grayson took the lead. I'm not sure which one completed it first. Before they got near the finish line, Connie and I had taken off at top speed so as not to get slimed by the kids post-run. Here's Brittney (red) and Sara (blue). I'll post more photos on the church youth blog soon. From the expression on the face of the girl in the first picture it looks like you caught her in the shower. Maybe if you put some of that war paint on the cheeks of my picture in the photo of the day it would make me look more fearsome. No enemy of the US would ever be afraid of the US fighting soldiers if they saw that picture of me. Yes, I'd be interested to know what Sara was doing in the 1st pic also...can't be good with that expression. What, no mud run for you? What a weeny! I did it last year, and there's plenty of incriminating evidence to prove it. GO MUD BOGGERS!